From time to time I hear from someone who is so fed up with their car they’ve decided to stop making payments and “walk away from it.” I always tell them, DO NOT EVER do that voluntarily. It is always the worst option available. Here’s the setup: You take out a loan to buy a car. The lender has a lien on the car as you make payments. If you want to sell the car, you have to pay off the lien to get a clear title. Sometimes, people get in situations where they decide to simply walk away from the car and the loan and just let whatever happens happen. The lender considers this a default. To most rational people this seems completely insane, but it’s often the result of several scenarios. I’ve seen people who had a defective car and felt it was “unfair” to be paying the bank for a car that didn’t run. Or the buyer ran into financial trouble — lost a job, costly divorce, etc. — and decided they could not afford to make the payments anymore. I have even seen cases where a co-signer who was not in possession found out that the other signer had stopped paying, and the co-signer thought it was “unfair” that they had to make the payments for a car that someone else was driving. Unfair as it may be, they’re still on the hook. Here is what happens when you stop paying: The bank hires a company to go snag your car. This is the actual repossession. 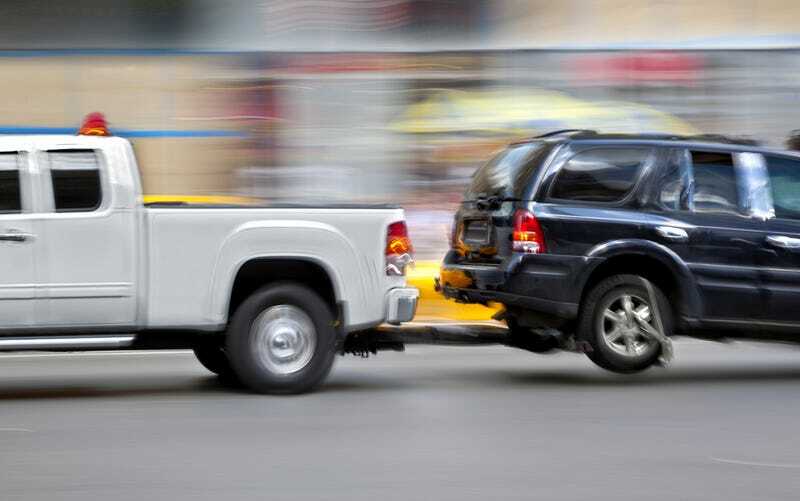 A tow truck shows up and drags the car away, often with your belongings in it. The car is taken to a yard where it is held because there is usually a right of redemption period where you could recover the car (if you pay a bunch of fees and get the loan caught up). The car sits in the lot and gets covered with grime. Your belongings vanish. The car is then sent to an auction where it is presented as a bank repo. The buyers at these auctions know that this is a crapshoot. So, the car sells for pennies on the dollar. The bank then sends you an accounting. What they received for the car, minus the auction fees, minus the legal fees, minus the cost of the repo and the storage, and minus the other sundry fees from the loan contract and you end up with a “net.” That net is applied to your outstanding loan. The outstanding loan less this net will almost always leave you with a balance. In fact, the balance might not be reduced much, if at all, depending on how well your car did at auction. So, now you owe a balance and you have a bank repossession on your credit history. What happens next? The bank sues you when you don’t immediately pay the balance and they get a judgment against you. That judgment includes the amount of the balance, plus attorney’s fees and court costs, plus interest. And this judgment also goes on your credit report. Hey, the hits just keep on coming! What should you have done? Well, just about anything but this. You could have sold the car yourself and gotten much more than the car will realize at a bank auction. Then you wouldn’t have had any of the fees tacked on (or the repo and judgment on your credit). I know that if you are upside down on your loan, this might be a problem. But you need to think long and hard about this. Is there any way you can scrape up the money necessary to get yourself out from under the loan? Can you borrow it from friends or relatives? I’d even consider putting a few thousand on a credit card if it will keep you from going the voluntary repo route, which will tank your credit even worse and expose you to legal problems. If — and I still say you need to do what you can to avoid this — If the repossession really is unavoidable, then cooperate with the bank. Don’t make them chase you for the car. Bring it to them and keep it clean. Anything you can do to keep their costs and fees down will benefit you when they calculate the net to you after the auction.